Bruce Willis is very much a household name these days; thanks mainly to the incredible success of the Die Hard franchise. He is as iconic as he is prolific, even if not all his films fire on all cylinders. Back in the day though, we’re talking the mid to late 80’s, he was best known as Cybil Shepherd’s co-star in the entertaining TV show, Moonlighting. It was whilst he was in the middle of his stint on this show, which ran from 1985 to 1989, that he had his first starring role in a movie. 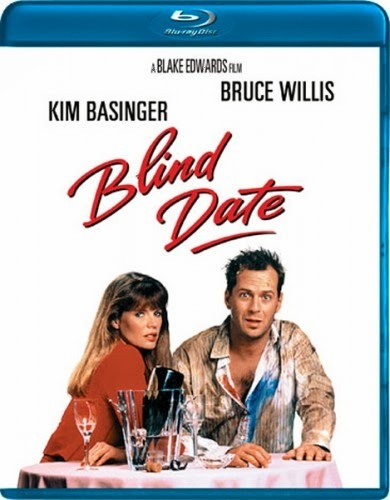 Well, it was starring, although Kim Basinger was top-billed, in the Blake Edwards comedy, Blind Date. The following year the stars would explode though, when he went on to make the aforementioned Die Hard. Blind date though was, and still is, a highly amusing slapstick kind of comedy, and it’s good to see it get a release on, an admittedly bare-bones, Blu-ray. Willis stars as Walter Davis, a young(ish) businessman who needs a date for a business luncheon. Thanks to a friend he ends up going with the delightful Nadia Gates (Kim Basinger), on the advisory that he doesn’t let her drink alcohol. Well, you know exactly what is going to happen now; Nadia does indeed drink alcohol, and from here on in the mayhem begins. Willis plays the straight man to Basinger’s outrageous turn as volatile drunk, and the laughs come fairly thick and fast. This premise alone, although funny, could only take the movie so far, and truthfully it does run out of steam in places, so it is great to see that another element was added. That comes in the shape of David Bedford, who is Nadia’s ex and is played superbly by John Larroquette. He truly is hysterical to watch, as the mayhem gets piled on. In fact, such is the combination of Basinger and Larroquette’s performances that Willis is somewhat overshadowed during the movie. Mind you, as mentioned, it was his first real movie, and as such I imagine it was a case of testing the waters for him, so to speak. Still, he does play the part of Walter well, although I feel you’ll enjoy Blind Date more for Basinger and Larroquette, rather than the ‘big’ star on display. At the end of the day, this is a Blake Edwards comedy, and if you like his films, you’ll no doubt love this. I thought it was great fun and still stands up as a good fun comedy, almost 30 years later. Sure, it would have been nice to see the Blu-ray have something in the way of extras (it has nothing), but the film alone is well worth your while. Blind Date is available now on Blu-ray from Image Entertainment.